Sandra Bruce here today, to tell you a bit more about my Material Matrix technique. I’ve touched on it before, and I discussed Chuck Close in my last blog, but I thought today I’d give a little more detail about my process for those of you who might be curious. It might pique your interest enough that you would want to try it! Consider taking my workshop at Zephyr Cove in September. 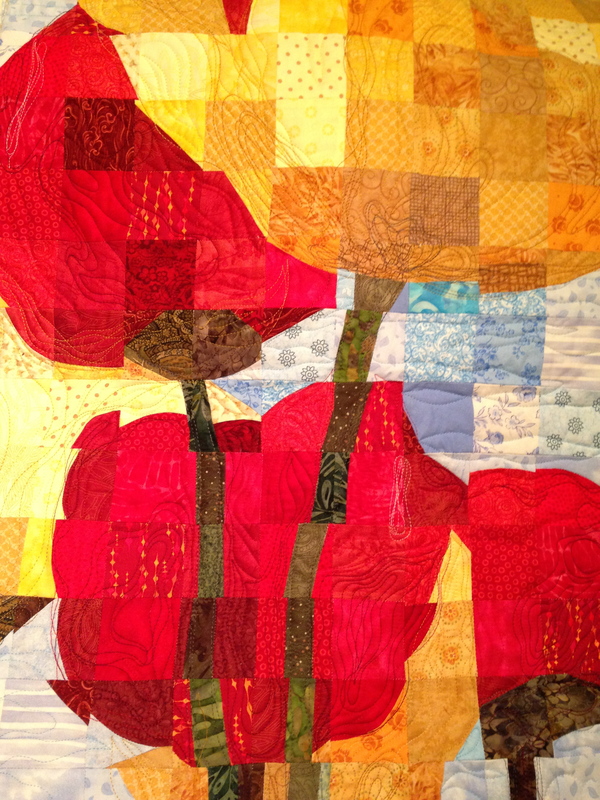 You will be able to work with a photo you want to turn into a very unique quilt. 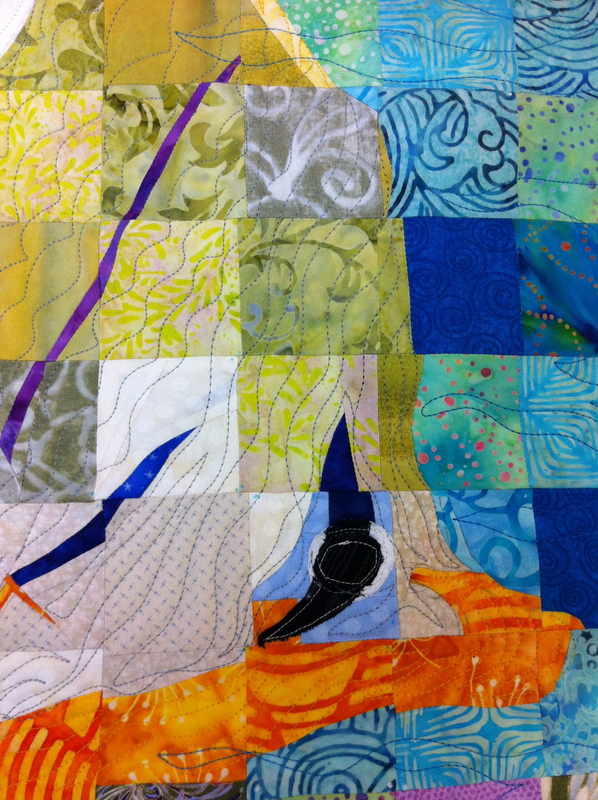 Recently I wrote an article about my process and work that is going to be featured in the April/May issue of Quilting Arts Magazine, coming out late in March (yippee!!) Writing the article made me stop and really think about how I do what I do. Here’s a little mini trip through my process, with pictures to illustrate. 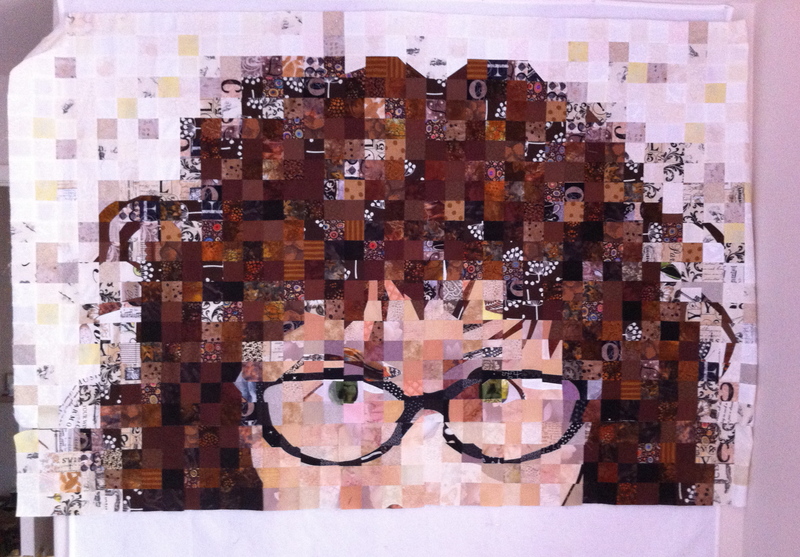 I’m going to use my Self-Portrait quilt as an example since I have the most photos of it to show you. 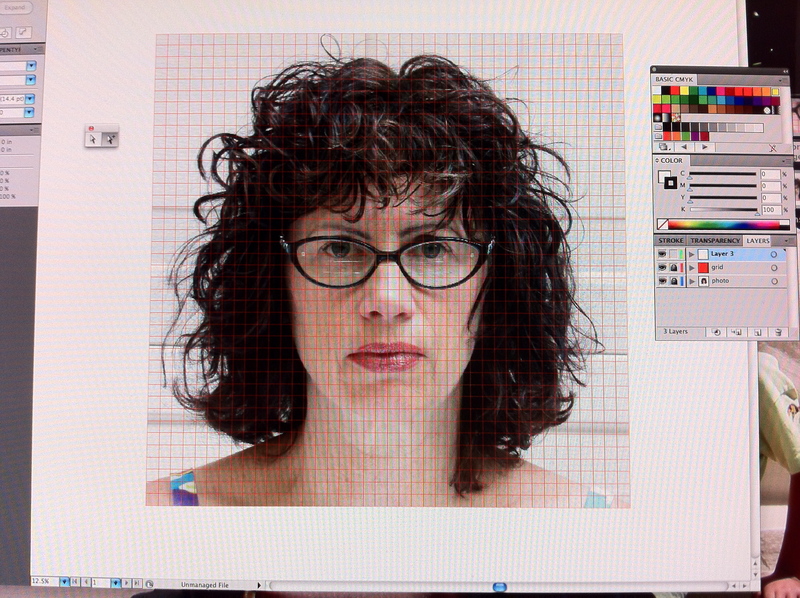 Inspired by Chuck Close, this is the photo I had taken to work from. Working in Adobe Illustrator, I applied a grid that was 40 squares wide by 40 squares tall, making it a whopping 1,600 squares total. I was not daunted. I pretty much jumped in. I had thought a lot about it, wondering how to interpret the squares with fabric, and finally decided to be wonky and as loose as possible. This requires discipline, and thinking, as the natural inclination is to match up and be pretty about it. Below is the first photo I took of my progress, the top of the hair, and at this stage I wasn’t at all sure I was doing the right thing. 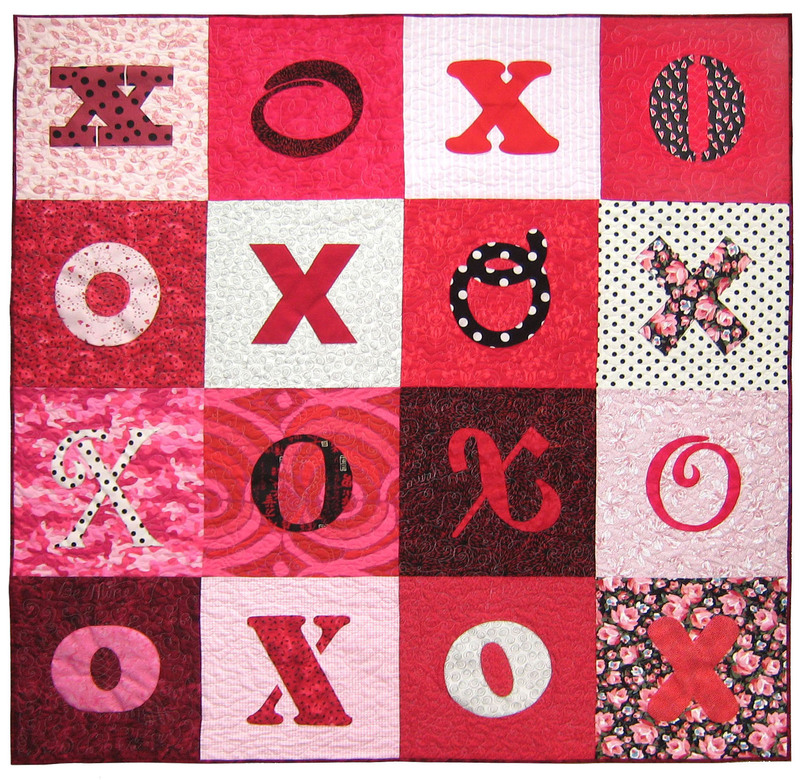 One square on the photo equals one 2-inch square of fabric. Fortunately I had the top of the hair and background in the top third of the image to decide if what I was doing was working like I wanted it to. It helped to use a reducing glass and stand back a lot to view it from as far away as I could get. I realized I was going to have to do some curved piecing. For those of you who have not tried it, I can tell you truthfully it is a wonderful thing to know how to do and is very liberating in technique…..and not hard!!! The eyes were the hardest part, which is also typically true in a painting or illustration. I just had to keep at it and refer to the photo, a lot. 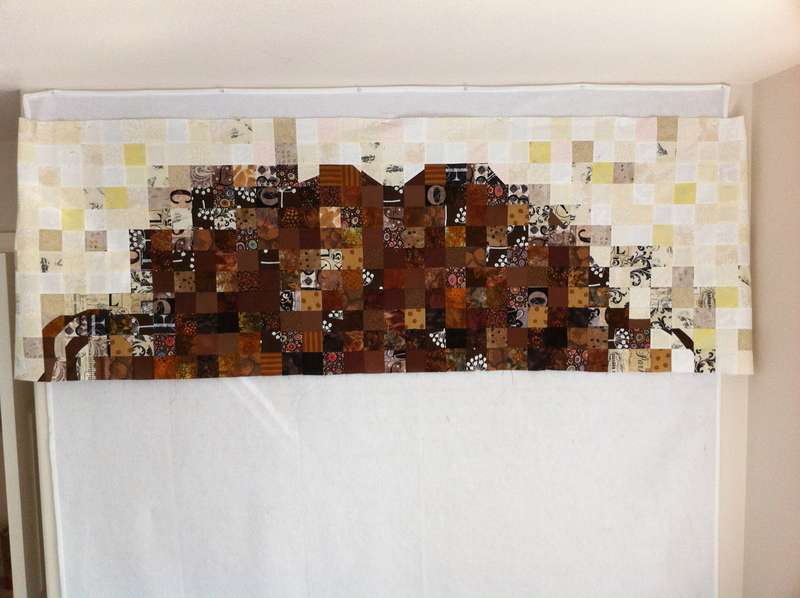 I sewed 4 by 4 blocks, then sewed the blocks together into rows, then added the rows to the existing rows already sewn together. 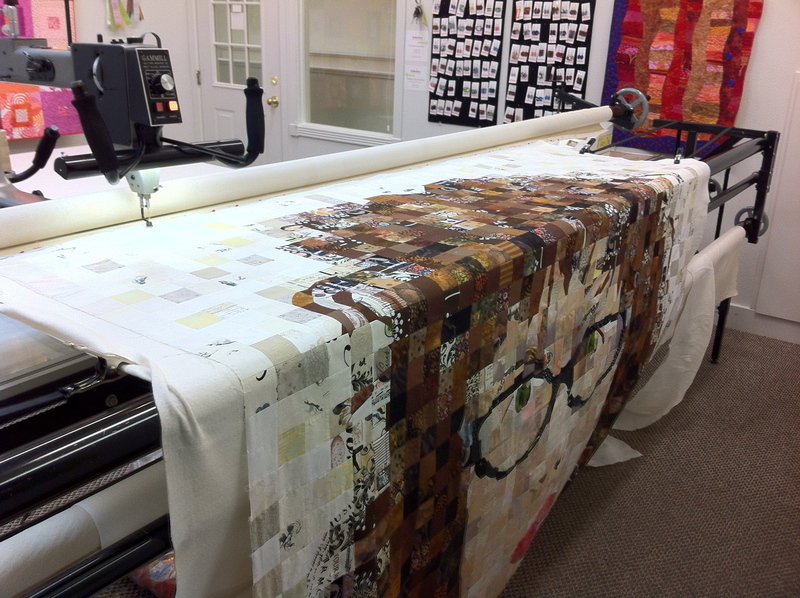 I fell in love with Best Press, which helped keep my rows and blocks square and crisp. There were…………….mistakes. I did some ripping out, but not a lot. 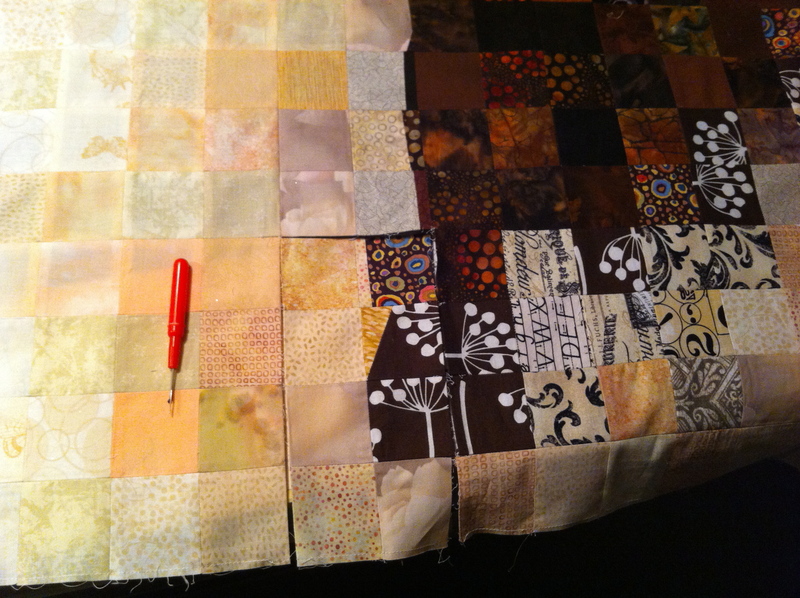 I use a small stitch length, about a “2” on my Bernina, so the seam ripper has to be my friend! I press open my seams. That you have to press to one side is just an old wives tale, as far as I’m concerned. 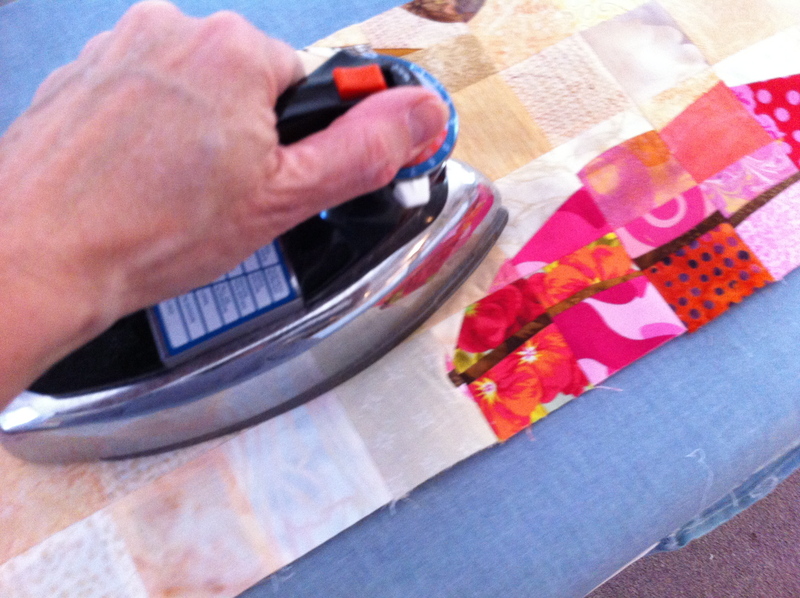 Pressing open makes the quilt nice and flat and easier to quilt. Here it is on my long arm, where I had the most fun, writing (stitching) words into the background and doing swirls and all kinds of thread changes. I have to say, the main thing I love about this technique is the element of surprise, not being absolutely sure what you’re going to get when you play with the wonkiness and placement. But when you stand back, and you’re happy with the results….what a great feeling! 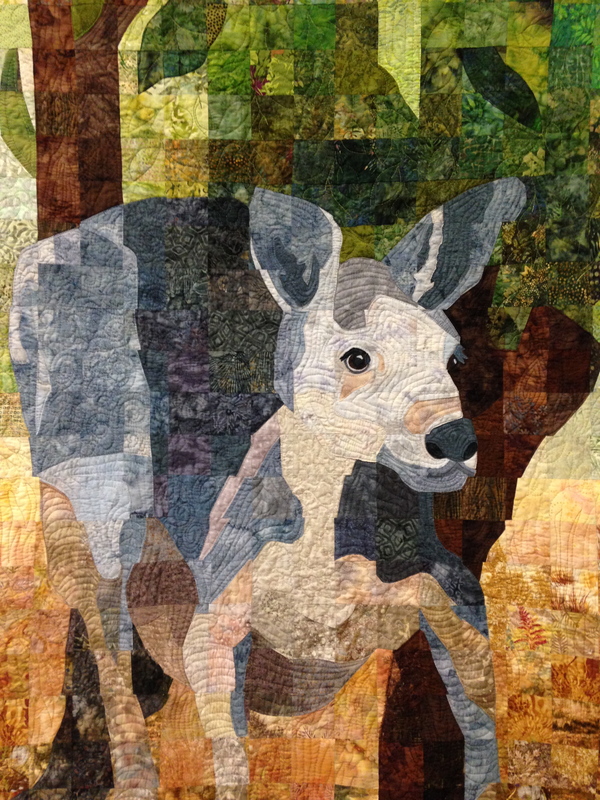 Here’s the finished quilt, 80″ by 80″. 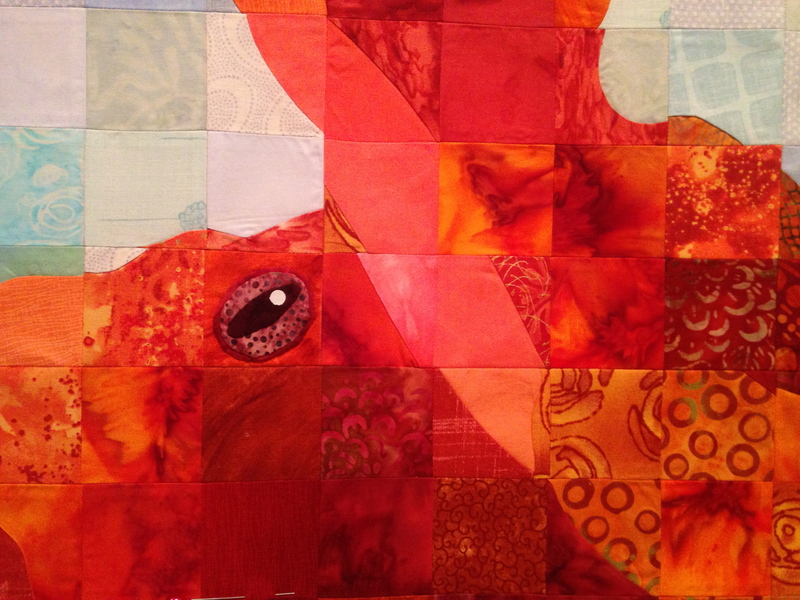 Here’s a sneek peek at my present project, a 70″ octopus in water, I’m naming “Octavius”. His eye follows me around my studio and we are quite attached. 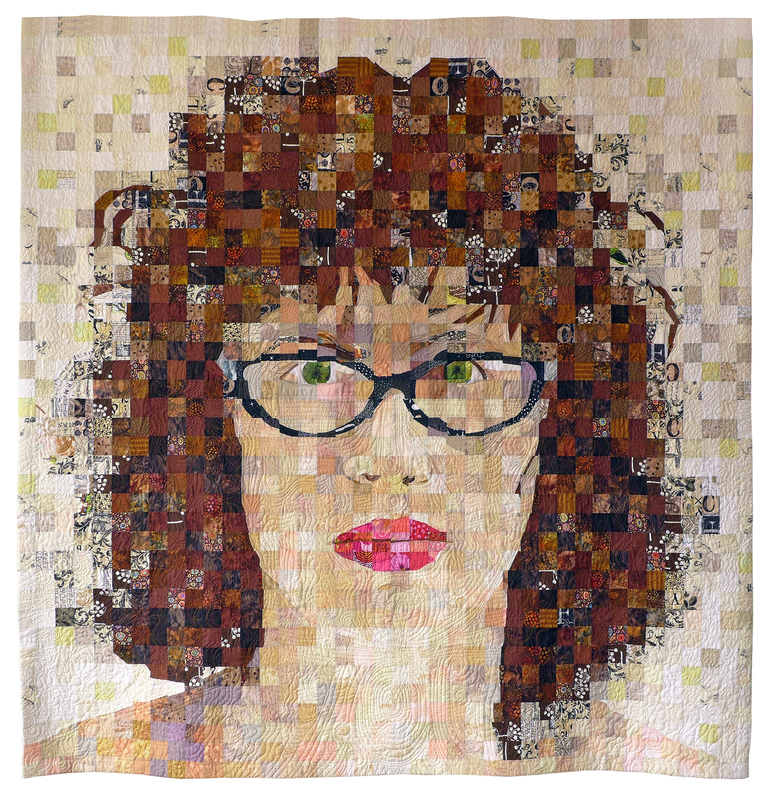 This entry was posted in Sandra Bruce and tagged Artistic Alchemy, Chuck Close, Material Matrix, quilting, quilts, Sandra Bruce by artisticalchemy3. Bookmark the permalink. Wow, Sandra! Love getting a peek at what is inside the process! Really helpful. Octavius! He’s watching you as you jump into an underwater adventure. Happy Valentine’s Day to you too! I am heading out on a road trip, but when I get back I’m going to call you. I need help on my mouth! My lips are so thin and pale that they don’t show up much and when I made them more red I look like a clown! I should have put some lipstick on for the photo. (Ha Ha! Like I have EVER worn lipstick) Other than that, I’m almost done!!!!!! But this has been a fun project, and once it is complete, quite an accomplishment. Robin, I’d be happy to help you with your portrait quilt, when you get back! Inspires me to try your technique. Love the use of prints to draw attention to eyebrows and soften the outlines of hair. Also peppering the skin tones with pastels and even some more saturated color really adds interest. 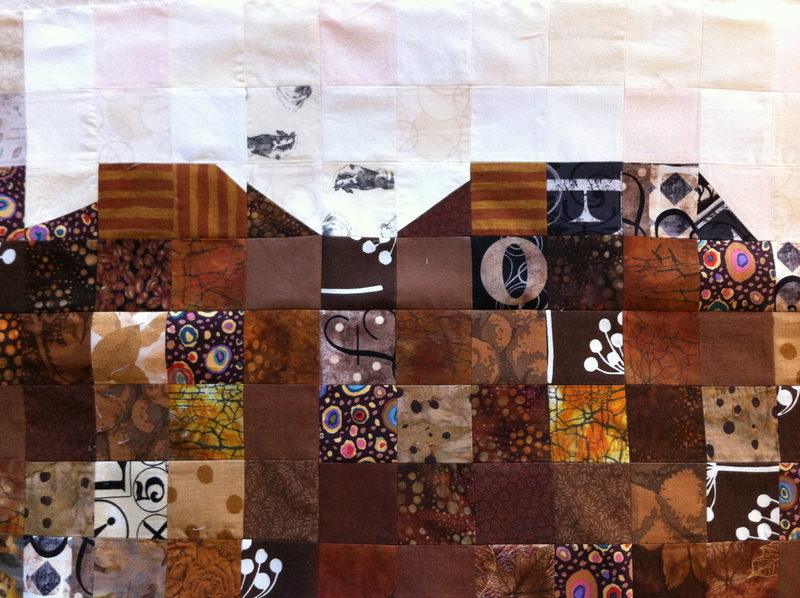 Your background color palate batiks are fantastic. Hi, Joanne, thanks for your comments. If you decide to try it, let me see what you create! If you’re anywhere near northern California I’d encourage you to try my workshop in September. I find it to be a very addicting technique, and just the right amount of challenge. Great article. The process is fascinating! I sure wish I could make it to your workshop, but I don’t think I’ll be available. I would love love love to take your workshop! I live in Northern CA and Zephyr Cove would be easy for me to get to. Do you have a 2016 calendar of workshops? Hi, Toni! Keep looking at our blog, our registration and schedule for Fall 2016 will be out in January. Thanks for asking!